here is your complete guide! small price in the size that YOU want. from this stuff until it hardens, but you can do it. Follow all the safety precautions listed on the can. the form comes out in the size and shape you want. Shake, shake, shake your booty your can of "Great Stuff" . to give your heart some dimension. 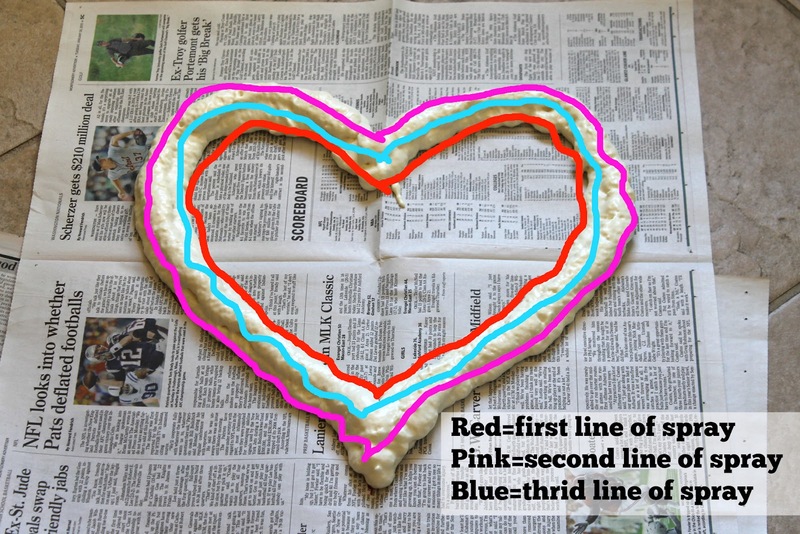 Sorry for the squiggly colored lines...I can spray the foam better than I can draw lines in PicMonkey. This wreath was done mainly to show how to spray the foam 'cause I don't have a picture of how I made the first ones. won't stick to your kids and animals). get 3-4 forms out of one $4 can of foam...what a bargain! about wasting the rest of the can of foam). temperature and the humidity when you are spraying. 2013 wreath forms puffed up a lot... a 2015 form did not. (about 15 minutes) how puffy your form is going to get, the can has sealed itself off and you need another can. It probably would not have yellowed if it had not been left to the elements out in the back yard. Red burlap is only $3.99/yard at Hobby Lobby ...even cheaper is you use a coupon. You can use any color or print of burlap for this project. on the size of your heart form, you could get by with 1.5 yards. show through the weave of the burlap. You might be able to skip the painting step if your burlap weave is tight and doesn't let the foam show through. Regular craft paint would work fine too to color the foam form. with a kitchen knife after the foam has cured for 8 hours. Cut some strips of burlap to cover the wreath form. the wreath with burlap flowers...sort of a "fool the eye" trick. The strips that were used to cover this wreath were 2" wide. for the roses will need to be wider). strips conform to the shape of the wreath. Your width of strips might need to be smaller if your wreath is smaller than this 15" wreath. the strips so they do not cover it up on the back. best) on the pins to keep them in place. Now comes the fun part...making the burlap roses! mine kinda large. They were about 4" in diameter. The strips that were cut for this size rose were 4" by 24". length too...you will need to see what appeals to you). the burlap rose is the same. matches your burlap color) knotted and ready. Fold the width of the burlap strip in half. raw cut edge of the strip. Start rolling the end point towards the fold for 1.5" to 2". This will be the center of your rose. hold the now-rolled burlap in place. Knot it to hold it. of the burlap in this stitch. The stitch does not need to be tight. Continue the straight running stitch along the whole edge. Start sliding the burlap strip down along the thread to gather it. of the strip has been gathered into a ruffle. rose lined up as you roll. add more of the gathered burlap onto the roll. and stitch it down to hide it and keep it from fraying as much. (especially when you see if from the street and not up close). Attach the rolled burlap roses to the wreath with a hot glue gun. a little since the rose has a kind of uneven and small base. "tidy up" the finished wreath. holidays on the front door but I like the change occasionally. hidden by a cuter red grosgrain ribbon. 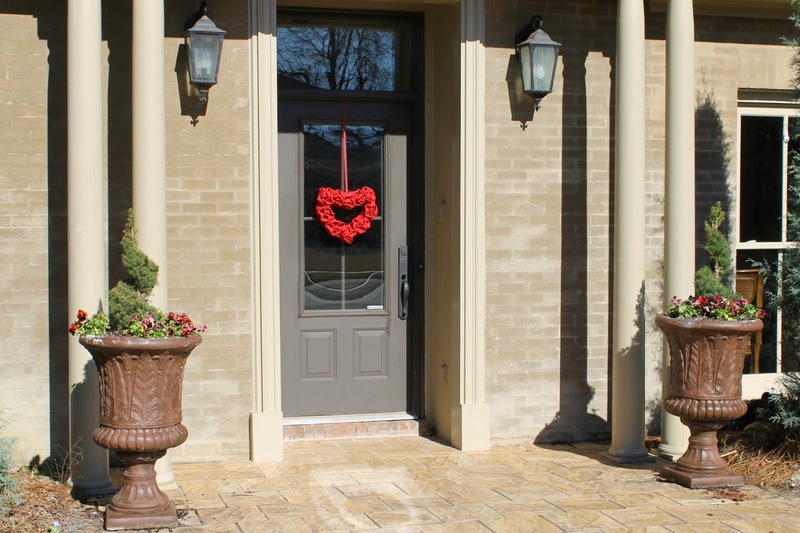 We had to replace the front door since it started "bleeding"
a little in the above pictures but it got much worse over the year. comes hot and heavy on that side of the house. Here is the carpenter, Adam, replacing the door and transom and also most of the trim around the door. Some of the wooden trim had rotted. and are not just a thin pop-on window grille (that fell off at lot). the old one. It probably had a nicer proportion of glass. We just reused the old door hardware. ...we don't have to mention this to Tom Kat m'kay? 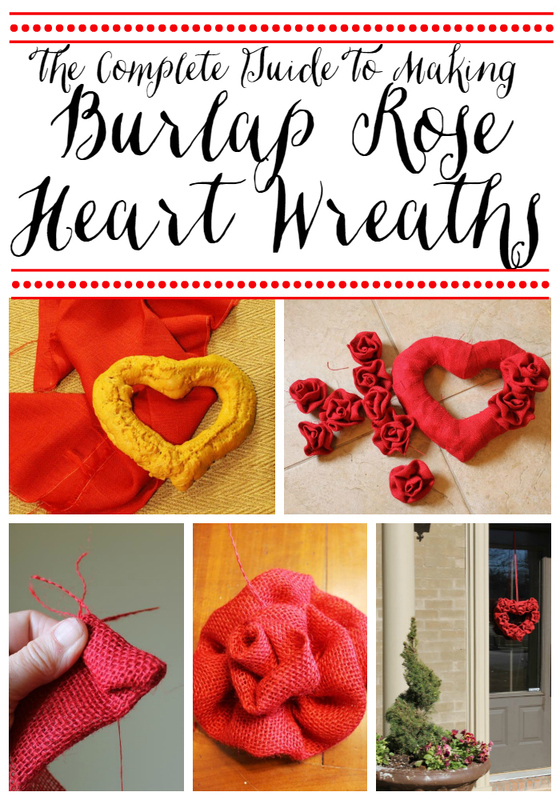 the Red Burlap Rose Heart Wreath! I love the way you made the heart - I need to steal this trick! These are adorable and I love how you showed how to make them step-by-step. You are so creative...I love your blog!